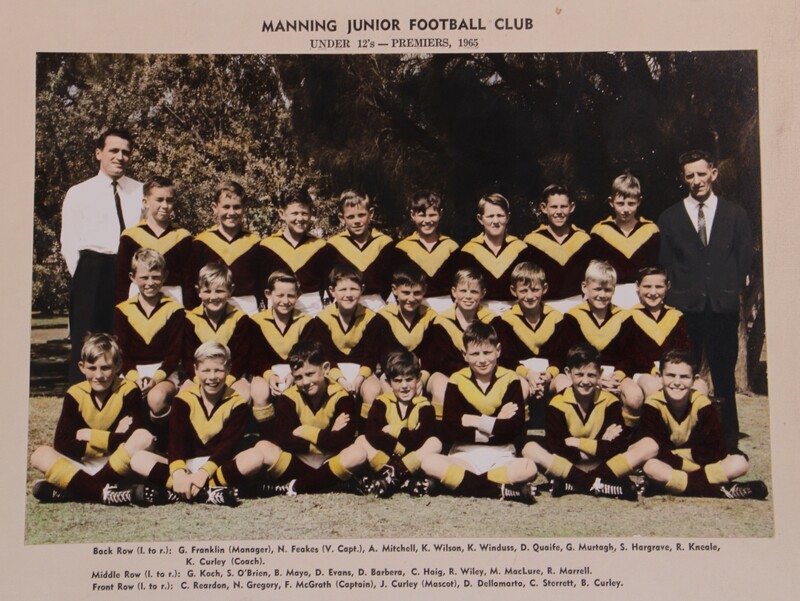 The Manning Junior Football Club was established in 1957. The clubs foundations were built on the hard work of local football pioneers such as the Bushell, Quaife, and Robey Families. 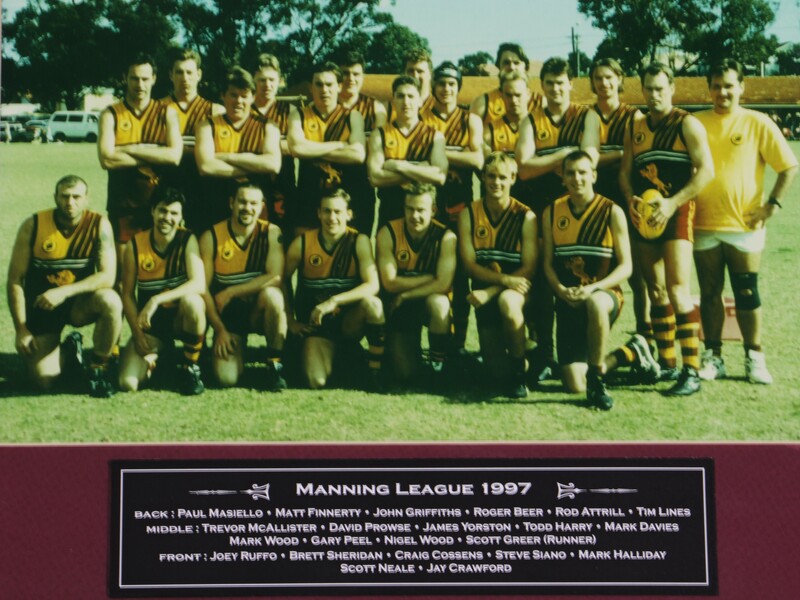 As a junior club, Manning developed a reputation as one of the strongest and most formidable clubs in the playing district, numerous premierships and the development of WAFL/VFL players Brian Peake, Peter Spencer, Rob Wiley, Mark Mclure, and Steve Hargreaves, identified Manning as one of the prominent junior clubs in the Perth District. Today, the Manning Rippers Juniors has over 300 participants ranging from Pre-primary through to Youth with a strong parent volunteer base. 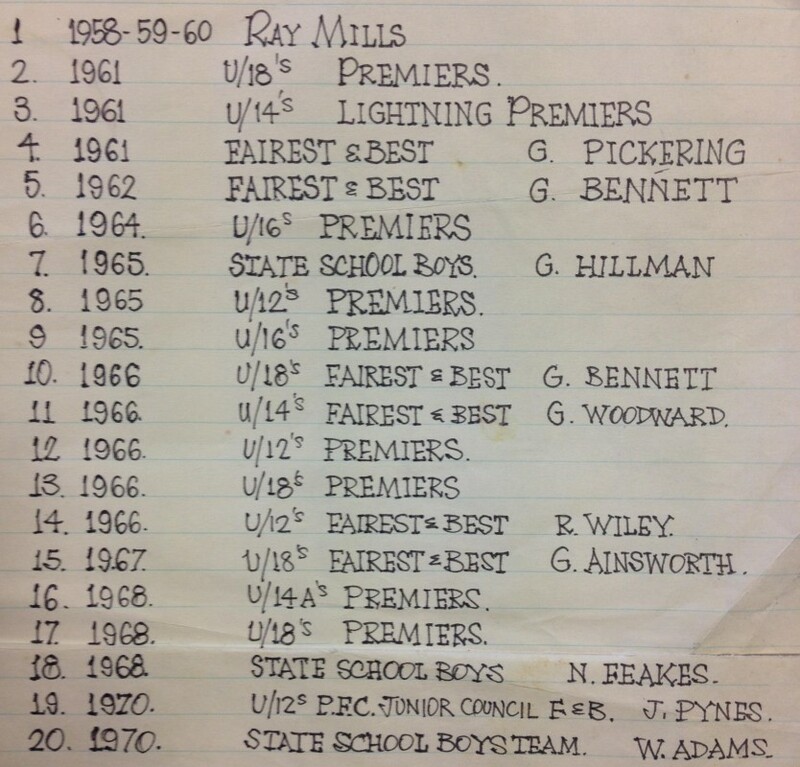 For the first ten years of the clubs history the Manning Lions predominantly played in the Peel and Sunday Leagues and were propelled by the strong work of volunteers such as Syd Price, George Robey, Guy Lovette, Joel Gajic and Sandy Murcott. On field highlights were the 1992 colts side narrowly missing out on premiership glory by 4 points (this side would produce two future league captains), the return of prodigal son Peter Spencer to coaching at James Miller Oval and the onfield dominance of six times fairest and best Paul Murphy. 1994 was a dark year for the club with a both reserves and colts folding however the emergence of a new group of young committee people saw the club battle through a losing streak that would reach 70 games. 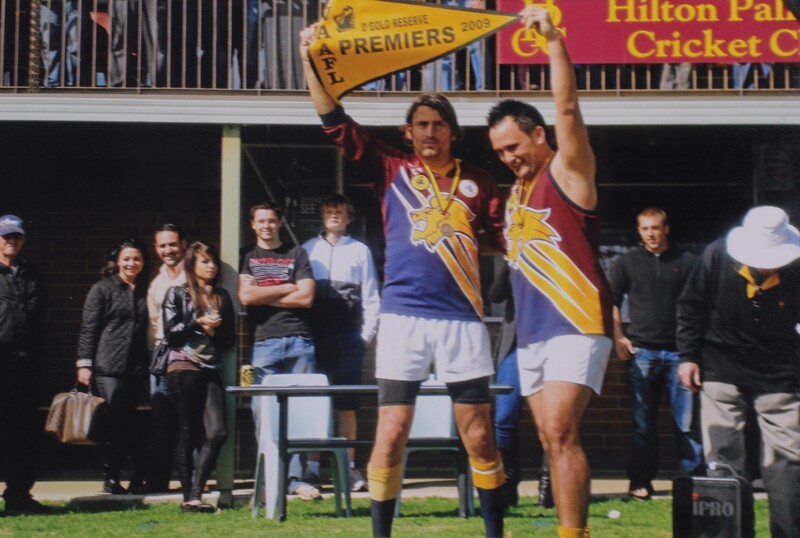 In late 1996 club leaders Anton Ferrari and Scott Greer began negotiations with the Bankwest Football Club. This saw a merger that created a new side called the Manning Rippers who began to play as a two team club in the WAAFL Saturday competition. The presidencies of Anton Ferrari (1996-97) and Scott Greer (1998-2002) saw the club gain financial stability ands some measure of on field success with the league side making the finals in 1997 and 1998 and the reserves finishing 3rd in 2001 and fourth in 2002. League stars during this time were Gary Peel and Trevor McAllister, captain John Griffiths and fairest and best winners Paul Murphy ( a record 7 times) Karl Edlinger and Erwin Edlinger. 2003 saw a new president in Paul Masiello, a new coaching staff and a new influx of players. 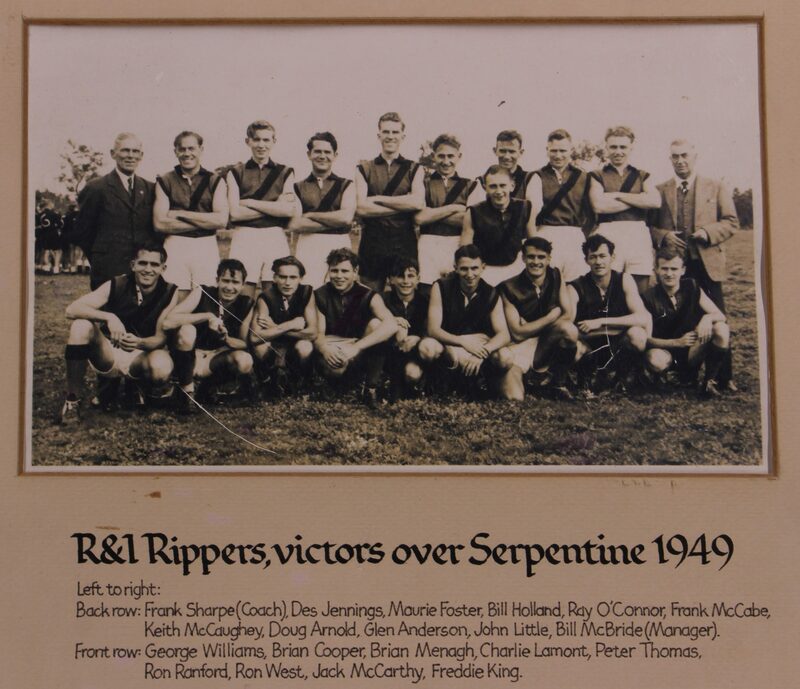 The Rippers just missed out on a finals berth and Ruckman Bob Braam won the Fairest and best. 2004 saw the return of club games record holder Nigel Wood as the league coach and a new attitude to the club. Under the guidance of Woody and reserves coach Barry Chaplin both sides made the finals and for the first time the league side won a final. 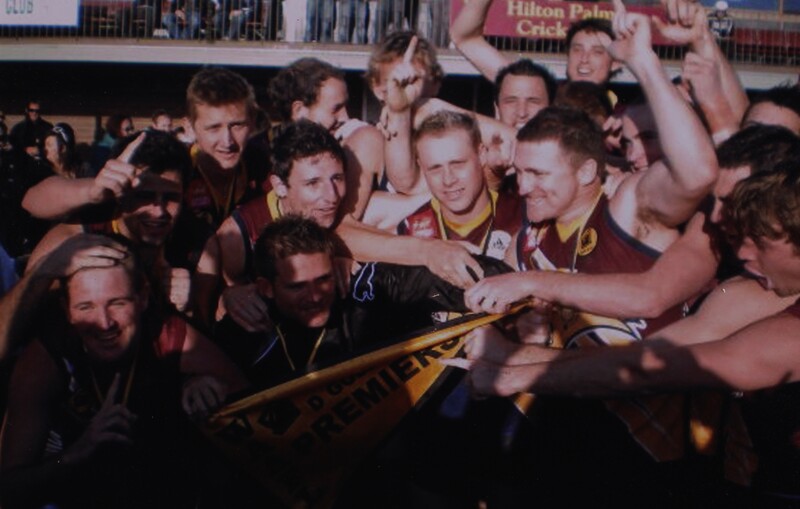 Stars in 2004 were fairest and best winner Paul Vardy ( who also got third in the league), captain Erwin Edlinger, ruckman Bob Braam and key forwards Luke Lovett and Brad Smith. At reserves level club stalwarts Paul Murphy ( yet another fairest and best) Todd Harry, Craig Mulder and Darren Christmass continued to impress. 2005 was without a doubt the most successful year in Rippers history both on and off the field. The redevelopment of the clubrooms, the continued success of the junior’s and our promotion to C-grade are all defining moments in the club’s history. 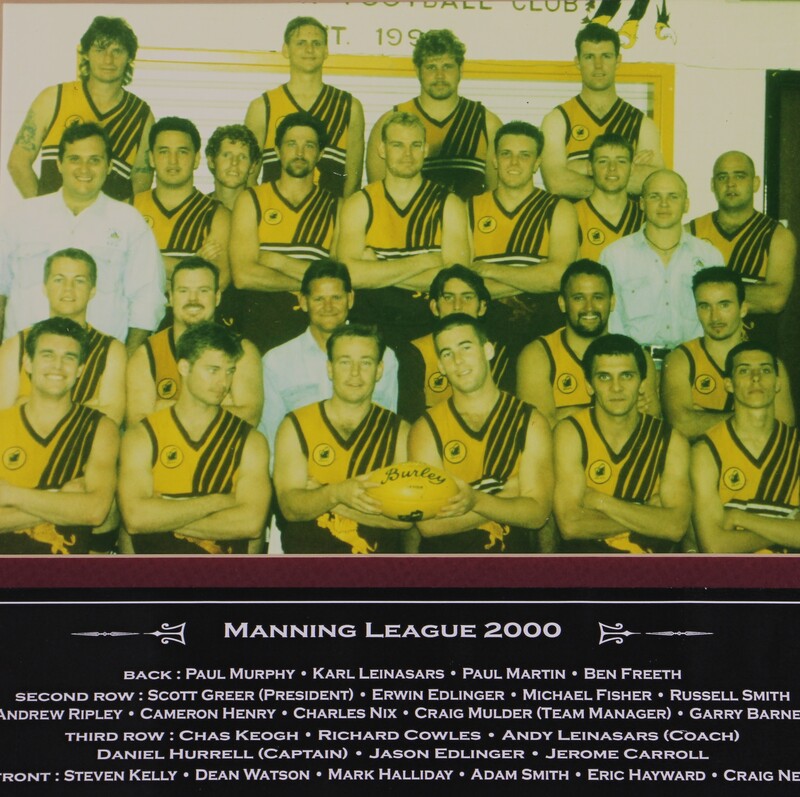 Both reserves and league team made the finals once again in 2005 with the league team just missing out on premiership glory after losing the grand final to Melville at Claremont Oval after leading at half time. The reserves team was also unlucky not to make the grand final after bowing out in the preliminary final also to Melville. The club’s first attempt at C Grade in 2006 and 2007 was a hard campaign. Hindered by an incredible run of injuries and narrow losses the winter winds blew extra cold. Every cloud has a silver lining though and in this season we unveiled a new potential champion in Chris Swarts who not only took out the club fairest and best but finished second in the league overall in 2006. The club also blooded in excess of twenty new players and learned some valuable lessons about what it will take to win at a higher level. The Rippers returned to D Grade in 2008 and learned the hard way that a team of talented players who don’t get properly fit and don’t play as a team don’t go very far. In the reserves the 2008 Rippers were able to finish fourth and this result led to John Chambers being promoted from reserves coach to league coach for 2009. With players returning from injury, three new floodlights, plans for new clubrooms and a quickly developing junior club under the senior umbrella there remained an air of confidence at Ripperland that the worm was about to turn. First both D grade sides finished the qualifying rounds in second position and the advent of H Grade saw the return to the club of many old faces. Then Chris Swarts won the fairest and best award for all of D Grade Gold (which would be backed up by a club fairest and best as well). Finally on Grand final Day both Rippers sides triumphed to put the first flags on the wall and return the club to C Grade. In 2010 the Manning Rippers despite the inspirational leadership of co-captains Ash Cripps ( 2010 League Fairest & Best) and Luke Lovett(Runner up Fairest and Best and fives time leading goal kicker) learned the hard way how much the additional depth a colts side provides is a pre requisite for higher grade in success. Demoted to the WAAFL’s C3 grade the desire to player higher grade football remains strong. 2011 saw the club return to the colts arena, where under the tutelage of Dave Parker the Under 19 Rippers battled through to the very last day of the season where they went down to St Norbert’s. Justin Crouch was the club’s fairest and best colts player and Hayden Noordhoek the Ripper Rising Star. At senior level John Chambers engineered a revival that saw his league team also make a grand final going down by only 9 points to Belmont. Chris Swarts once again secured the Rippers Fairest and Best chased hard by full forward Ash bentley who kicked 89 Goals. The reserves coached by Craig Mulder and inspired on field by WAAFL C3 Reserves (and club) Fairest & Best Erwin Edlinger also were able to play finals football. Off the field the club achieved Quality Club Silver Accreditation, launched their inaugural girls Auskick competition and were awarded the Best Senior club award in the Perth Demons District. 2012 was a year in which the Manning Rippers Football Club had to at all costs hold their ground. Maintaining a place in C2 rather than just slipping back to C3 was the number one priority followed closely by the need to further legitimize the club’s colts programme by making finals for a second year in a row. Under the experienced tutelage of Richard Bewick , the league side managed to beat twice the two sides below it, sneak wins against Kenwick and Swan Valley and significantly push top 3 sides Canning and Gosnells. Ash Cripps secured his 2nd Fairest and Best for the club and Luke Lovett once again lead the goalkicking. At reserves level Veteran Todd Forknall not only won the club’s fairest and best but finished runner up for the whole competition. At colts level the dominance of Club and Competition Fairest & Best Aaron Holmes and Competition Runner up Jackson Chapman inspired the colts to finals action once again where unfortunately injuries lead to a final result below what this young team deserved. Other highlights for the season were the selection of Aaron Holmes, Jordan Strachan and James Pinci in the Amateurs State Under 19’s side, the induction of club icon Paul Masiello into the Hall of Fame and the presentation of life membership to juniors head honcho Brad Coopes. Football is often cyclical and there is no doubt the club’s senior sides struggled during this two year period as injuries and an exodus of players to WAFL and country clubs took their toll. Every era of the club has it’s champions and the honour boards will proudly recognize Shaun Sullivan as 2013 League Fairest & Best . Shaun was promoted to League Captain in 2014. That year saw ruckman Adrian Preston secure his second fairest and best with the club . Other highlights were the 200th game of club champion Luke Lovett and a 100 point thrashing of East Fremantle by our league side in the last game of the year that allowed the club to pause, reflect and plan for 2015 with some optimism. In junior ranks the club continued to grow and the season ended with joy when our Year 8’s won a premiership. The appointment of ex Claremont player Clayton Gardiner as league coach saw the club’s seniors conduct their hardest pre-season in 4 years and the extra work done by the players in addition to a greater sense of camaraderie off the field saw the Rippers league team win six games and lose a further five games by less than 10 points building a strong foundation for 2016. Season 2015 was closed by a magnificent 200 point victory against Secret Harbour in club stalwart Chris Dalton’s 100th game. The club’s fairest and best player for 2015 was Justin Crouch. At junior level four Manning sides made the finals in 2015 with Matt Bateman’s Year 9’s group securing a premiership to add to their year 8 trophy from the previous year. Across the road construction began on the Manning Hub development which would house the club’s new rooms. Not a member? Register with Manning Rippers now!